Welcome to REFLECTIVE SIGN SHEETING - Division of Reflective Inc.
On this site we carry wider rolls of reflective material. For narrower rolls you can go to www.reflects-light.com (prismatic) or shop.reflectivestore.com (standard glass bead). We carry both Nikkalite and Reflexite brands of retro-reflective sheeting. Retro-reflective simply means that light is reflected back to the light source. Reflective Sheeting is used in two ways. First, it is used for road signs and private signs. Both for the background and the lettering. When creating lettering, a computer controlled cutter/plotter is used. For road signs MUTCD standards would apply. For private signs these standards normally do not apply. Second, reflective sheeting is used to mark a variety of items in a effort to make them visible both day and night. Bollards that protect buildings and other objects are an example of this. Reflective chevron panels on the back of fire trucks is another. Reflective sheeting is also used to mark dumpsters, containers, vehicles, boats, farm equipment, industrial equipment, fire apparatus, helmets and much more. We carry nine types of reflective sheeting. They are listed below by brightness. 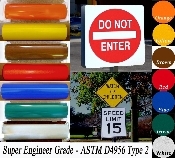 On this site we also carry Clear Overlay Film (graffiti protection), Colored Transparent Electrocut Film for overlaying white reflective, Prestriped Reflective Barricade Tape, C88 Stimsonite Reflective Road Markers and Premade Reflective Chevron Panels. Here is a link to an MUTCD article that will explain what type of sheeting needs to be used for certain signs. CLICK HERE. We invite you to browse through our store and shop with confidence. You may create an account with us if you like, or shop as a guest. Either way, your shopping cart will be active until you leave the store. If you have any questions please feel free to contact us at steve@reflectivestore.com or call (850) 934-3157 for assistance. If you need to request a quote you can email us or our FAX the request to (888) 789-5422. Thank you for visiting. Click here for our Complete Line of Non Skid Tapes. Click here to go to our Reflective Shapes Site. Click here to visit our Reflective Chevron Panel site. Standard Engineer Grade Type 1 Reflective Sheeting by Nikkalite. 7 year outdoor durability. Easy to work with. Bright long lasting colors. Our Flexible Engineer Grade sheeting reflects at about 75 candlepower for the white. Primarily used for emergency vehicle striping and graphics but can be used in a variety of other applications.. Available in 8 colors. 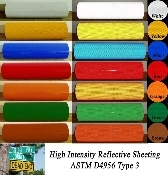 High Intensity Type III Reflective Sign Sheeting. Primarily used for sign backgrounds. 4 times brighter than standard engineer grade reflective tapes. Allows your signs to be seen from much farther away. Our Flexible High Intensity Grade sheeting reflects at about 250 candlepower for the white. Used for traffic cones and road barrels but can be used in a variety of other applications. Plotter cuttable. Available in 3 colors. 24 inch wide rolls of Reflexite V82 Type 5 Material. Manufactured by Orafol. Available in standard yellow, school bus yellow, red, green, blue, orange, and white. 24 inch wide rolls of Reflexite V98 Conformable Prismatic Material. Manufactured by Orafol. Available in red, green, blue, fluorescent orange, fluorescent lime, fluorescent yellow and white. Crystal Grade Type 8 Retro-Reflective Sign Sheeting. Exceeds MUTCD standards. 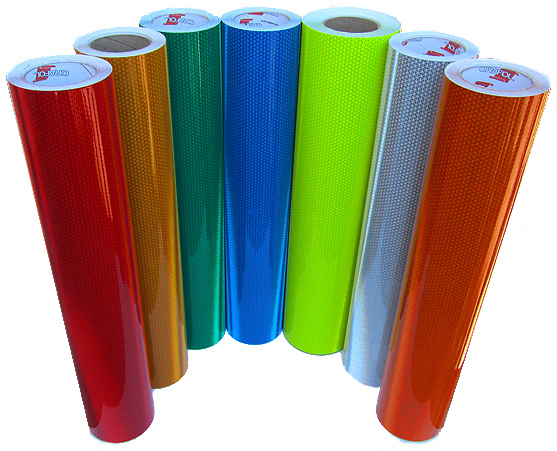 Reflective Sheeting that is cuttable using computer controlled vinyl cutters or plotters. Also called CAD cuttable. Pre-Striped Barricade Tape available in red/white or orange/white. Engineer Grade Type I and High Intensity Type III available. Reflective Stimsonite Road Markers. 4" x 4" model C88 coated. Bi directional reflectivity. Currently available in blue, yellow, white,yellow/red,green,red and white/red. Can be purchased WITH or WITHOUT adhesive pad. Clear Nikkalite Overlay Films. A-Cal Economy brand and F-Cal premium. Pre Made ready to install chevron panels made from Reflexite V98 Fluorescent Lime Yellow material with red stripes. Very bright and tough. Welcome to our Reflexite Wholesale Page. On this page you can order full rolls of Reflexite / Orafol Prismatic Retro Reflective Tape. To order simply use the drop down menus to select the type film and color you would like. Reflexite V82 Type 5 Reflective Rolls 24"
Reflexite V82 Daybright 24" wide rolls. Available in 10 foot and 50 foot rolls. Perfect for cutting on a plotter. Available in Red, School Bus Yellow, Standard Yellow, Green, Blue, White and Orange. Pre-made reflective Chevron Panels for the back of Fire Apparatus, trucks, emergency vehicles and other vehicles. Made from Reflexite V98 Fluorescent Lime Yellow material. Very bright and rugged. 12" widths available. Custom Order. To enter a product description check the box below labeled "Custom Order Information". A text box will open. To enter pricing use the drop down menu and choose a number. Example - for $900 choose $100 and then select a quantity of 9. Engineer Grade Pre-Striped Reflective Barricade Tape. 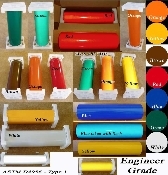 ASTM D4956 Type-I Reflective Vinyl Rolls. 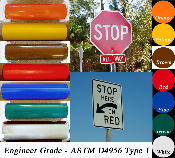 Used in a wide variety of applications from gates and barricades to bollards and trailers. Approximately 75 Candlepower. Nikkalite reflective sign sheeting in 150 foot rolls. Available in 12, 24, 30, 36 and 48 inch widths and in white, yellow, red, orange, blue, green, and brown. ASTM D4956 Type 1. Nikkalite "flexible" engineer grade reflective sheeting in 150' rolls. Available in 12, 24, 30, 36 and 48 inch widths and in white, yellow, red, orange, gold, blue, green, and black. ASTM D4956 Type 1. Nikkalite High Intensity grade reflective sheeting in 150' rolls. 3 times as bright as EG. Available in 12, 24, 30, 36 and 48 inch widths 7 colors. 10 Year Type 3 sheeting. High Intensity Grade Pre-Striped Reflective Barricade Tape. 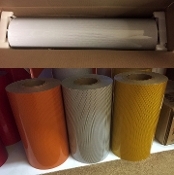 ASTM D4956 Type-III Reflective Vinyl Rolls. Used in a wide variety of applications from gates and barricades to bollards and trailers. Approximately 250 Candlepower. Reflective Stimsonite Road Markers. 4" x 4" model C88 coated. Bi directional reflectivity. Currently available in blue, yellow, white, yellow/red, green, red and white/red. Can be purchased WITH or WITHOUT adhesive pad. Reflexite V98 Daybright 24" wide rolls. Available in 10 foot and 50 foot rolls. Available in Red, Green, Blue, Fluorescent Lime, Fluorescent Yellow, Fluorescent Orange and White. Nikkalite Super Engineer grade reflective sheeting in 150' rolls. Twice as bright as EG. Available in 12, 24, 30, 36 and 48 inch widths 7 colors. 12 Year Type 2 sheeting. For assistance just email me at steve@reflectivestore.com or call me at 850-934-3157.